Shares of Macromedia, known for its Dreamweaver Web-design program and Flash, which animates and adds interactivity to Web pages, rose more than 8 percent in early trading, while Adobe shares sank 11 percent. Both companies said the long-rumored acquisition was not to consolidate and cut costs but to help Adobe expand into new markets, particularly in the area of providing content to mobile phones and other handheld devices. Adobe's software includes the popular Acrobat program for creating and reading documents in the PDF format, as well as the popular Photoshop program for working with digital photographs. Macromedia, based in San Francisco, recently announced tools for expanding its reach into mobile devices. "This is not a consolidation play. This is all about growth," said Bruce Chizen, Adobe's chief executive. "We're doing this because we believe the combined offerings will be even more compelling to our customers given the challenges they're going to face in trying to communicate information in this very complex environment." Neither company would speculate Monday on actual product plans after the deal is closed. There is some product overlap, including Adobe Illustrator and Macromedia Freehand in graphics design, Adobe GoLive and Dreamweaver for Web page creation, and Photoshop and Macromedia Fireworks for working with photos and other graphics. 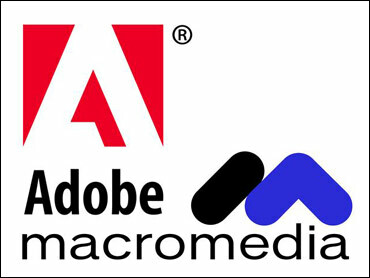 Under terms of the deal, approved by the companies' boards of directors, Macromedia stockholders will receive 0.69 shares of Adobe common stock for every share of their Macromedia common stock. That will result in Macromedia stockholders owning about 18 percent of the combined company when the deal closes. Shares of Adobe lost $6.77, or 11 percent, to $53.89, in Monday morning trading on the Nasdaq Stock Market. Macromedia shares gained $2.76, or 8.3 percent, to $36.21. The transaction, contingent upon the approval of regulators as well as the shareholders of both companies, is expected to be completed by the fall. The combined company will keep Adobe's name and San Jose headquarters. Afterward, both struggled as Internet boom ended, said Steven Elop, Macromedia's chief executive. "We were largely focused inward, making sure we had the strategies in place for the next generation of activities," he said. "We both, in parallel, developed visions that turned out to be very complementary, and we established a track record of success that puts us in a much stronger position to look outward." Chizen will remain as chief executive of the combined company and Adobe's Shantanu Narayenb will continue as president and chief operating officer. Elop will join Adobe as president of worldwide field operations. The companies said they are in the midst of developing "integration plans" that will build on their similarities. They did not mention layoffs. "While we anticipate the integration team will identify opportunities for cost savings by the time the acquisition closes, the primary motivation for the two companies' joining is to continue to expand and grow our business into new markets," Chizen said. "It's a lot easier to combine two companies that are healthy and doing really well with lots of growth than it is to try to acquire and integrate a company that is broken," Chizen said. "That is the piece that gave us comfort in taking the next step."